Pancetta is a savory addition to this simple pasta dish. Cook pasta in large pot of boiling salted water until tender but still firm to bite, stirring occasionally. Drain and return to pot. Heat 2 tablespoons oil in heavy large skillet over medium heat. Add asparagus, pancetta and garlic and sauté until tender, about 5 minutes. 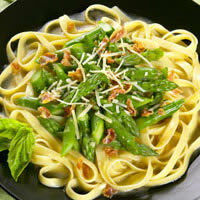 Add asparagus mixture to pasta. In the same sauté pan, bring the broth and wine to a boil. Reduce to a simmer and add the butter, salt and pepper to taste. Add the wine mixture to the pasta. To serve, top pasta with the chopped basil and grated cheese.